Last week there was a baby shower for my sister who is due with her first baby in September, so I needed to get a gift for her. 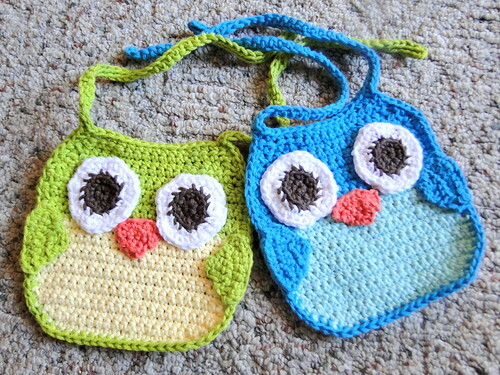 She really likes owls, so I made her these two bibs and got a few owl toys to go along with the present. I used this bib pattern but made a few changes to it, I made the eyes larger and for the wings, I used the beak pattern but added two extra chains to the start to make it bigger. I seriously love how these turned out, I think they are adorable! I'm so happy with the end result. I used Bernat Handicrafter cottons in these combos, hot green/pale yellow and hot blue/robin's egg. The beak is tangerine and I used white and brown for the eyes. I can't wait for my newest nephew! I've got more crochet to make for him, crocheting baby things is so fun. Oh how sweet,what a lovely gift! How adorable! Love the color combinations. They are so cute... perfect! cute!! I like the way you changed the pattern too. How lucky your sister is, those are "sweet", they look happy and make you just smile. This may just be the absolute cutest bib I have ever set my eyes on! Thank you for sharing this stellar pattern! These are ADORABLE. I think maybe I want one. For myself. Just to make eating more fun. I love these owls too! Your adaptation is much cuter than the pattern. I am your newest follower. 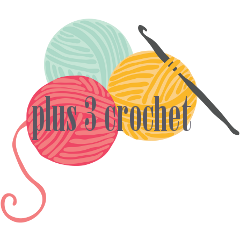 You have great crochet ideas. Love, love, love it! Thanks so much. Thanks for the cute Owl Bib Pattern. I will be making these for my next Baby Shower. How did you do the eyes or how much bigger?